Institutional traders are renowned for being good at what they do–they are professionals, after all. So what is it that separates them from your typical, everyday cryptocurrency investor? Is it their strategy? Their mindset? CoinFi’s CEO Tim Tam and Head of Crypto Research Jonney Liu share their professional trading experiences and insight in this episode of the CoinFi Podcast. Tim: I think, understanding, instead of getting a 10-step formula, people are always try to get a 10-step formula to try to make money. It's never that simple. The 10-step formula is go read 10 different resources and come to your own conclusion. Nate: Welcome to the CoinFi Podcast. We have a lot of random conversations about crypto in the office and we thought it would be interesting to just hit the record button and riff on whatever topics come to mind. The idea is that you get to be a fly on the wall in the CoinFi office, giving you an inside perspective on how the team members of a fast-growing crypto startup look at this crazy new industry. The CoinFi team has an interesting mix of backgrounds: co-founding a hedge fund to launching a Bitcoin exchange in Shanghai back in 2013 to heading algo development for major banks to managing data science for online brands with hundreds of millions of pages a month. And on each episode, we pull in different team members to talk about areas where they have professional expertise or maybe even just a strong opinion. Today was have a very interesting panel and a topic that we think about here a lot here at CoinFi: How do the mindset of an institutional trader in traditional finance compare to the typical mindset of a trader in the crypto world? With me today are CoinFi Co-Founder and CEO Tim Tam who was a hedge fund trader in a past life with 15 years of experience trading to equities markets. Also with us here today is Jonney Liu. He was formerly a senior derivatives trader with 11 years experience trading derivatives. Most recently, he left his job at a $350 million volatility arbitrage hedge fund to join the CoinFi team. He's currently working with the team to develop signals and algorithms for the CoinFi platform. Both of you guys spent your professional lives trading in the equity markets and both of you have also left institutional finance to enter the crypto world. Obviously, from a trading and industry perspective, you both saw a lot of opportunity which is why you jumped into crypto in the first place. But I know listening to you guys talk about the crypto markets in the office, well, let's just say there's a lot of face palming sometimes when you see what the average crypto investor does. So maybe let's start with you, Tim, what is it about this market that you see that the average crypto investor does not see? Tim: That's a good question. I think to me, and I think any investor or any individual, kind of the way they look at markets or the way that they look at investing is largely colored from their own personal experience as well. From all my training in institutional financing, the first thing I learned and the first thing I always look at is am I going to lose my money. And it's always the first thing I look at, so if we summarize I think, it's really looking at a risk-adjusted return basis and kind of in a simple form, I think a lot of retail investors are focused on how much money can I potentially make. But I always look at for each particular trade idea or trade, what is my potential downside and what is my potential upside. So a very simple example is say with an arbitrage strategy. I love those strategies because it's a low-risk way, even if you're making 1%, .5% per trade. I think the average crypto investor is not interested in that, but if you look at it from an institutional point of view, if you make a fairly riskless trade for .5%, 1% consistently and you can scale it, you can make a lot of money, so that's the first big difference. Jonney: Yeah, I think for big institutions, they think about doing small gains and adding up to a whole because of risk-adjusted returns. I think the reason for that more and more so nowadays than before is because of the low-interest environments and now we're kind of leaving that environment, but it's put a lot of pressure for hedge funds to make incremental gains because that extra 1% is actually writ very large. But for a crypto trader, I mean the opportunity is very wide open and people, right or wrong, they're not looking for that 1% step in gains. They're looking for the really big home runs and that to me is the biggest difference. Over time, I think, a lot of people who were retail traders back in the finance market have kind of been kicked out because they missed out on probably what is like one of the best equity rallies from 2008. I don't really know this, but I was just double checking. In 2008 the S&P was trading at 830 and now it's trading 2800. Tim: Yeah, I remember the low as 666. Funny number, 666. Jonney: So it's like four times from the lows, right? And it's four times from the lows and on top of that it's gone in a very almost linear fashion. Last year actually, from my volatility experience, it was the lowest of the VIX. For people who don't know the VIX, the VIX is the measure of the expected volatility in the market and basically, we've just gone up. Tim: Up in a straight line. Jonney: In a straight line. No draw downs and I think a lot of people who were not invested because they got wiped out in 2008, now are looking back and saying, "Hey, where can I see my returns?" I think they kind of feel gamed by the market and the crypto is a new exciting space where they can look for the really fast returns that they kind of missed out on. Tim: So what is VIX and also, off the top of your head, I mean I know you follow this closely, but what was VIX last year and what is the definition of VIX or volatility to the average retail investor? And then what is the volatility of Bitcoin right off the top of your head? I know we kind of run some calculations and things. Jonney: So VIX is the generally accepted indicator of fear that basically looks at the S&P and then looks at S&P options to imply what the future movement of volatility might be. So if a VIX is high, then people say usually that people are fearful of the market. Tim: So in 2008, it crashed, right? What was the VIX then off the top of your head? Jonney: Off the top of my head, I think it might have hit as high as 60 or 70, 80 range maybe. Tim: And that's like the peak, right? Jonney: That is on the peak, yes. Jonney: Last year is multi-year low on average. Tim: Okay, so what is the VIX equivalent in Bitcoin? I think it's like 60 to 80 range consistently. Jonney: I think it's at a minimum of 60 until the last two days where we had kind of a sell-off in Bitcoin. It was actually trending down, but I think it's probably in the 80 range. Tim: Yeah. Which means for the average investor, they can expect Bitcoin to swing 80% within a year. Is that the way to look at it? Jonney: Yes, I mean it's not quite the same, but in the relative sense, Bitcoin is probably like eight times more volatile or seven and a half to eight times more volatile than the traditional market. So the type of strategies that you run are actually very different because institutional trade is looking for that 0.1% gain is actually massive and also you've got to think about the base of money that these institutions have versus what individual crypto holders have, right? Institutions, I mean, back in the day, hedge fund was a novel thing and if you held over $100 million, then you were considered a large fund. I mean now the largest funds are holding $30, $40, $50 billion, so you can imagine that 0.1% or even 1% gain is massive. I mean it's not the same amount of money as it was before, while crypto, I mean most people are running a few thousand dollars. Yeah, that 1% gain doesn't seem like a lot in the absolute sense. Tim: What about, do you think there are any risk measures or anything like that me and you kind of look at or what people in institutional finance, I guess? I'll throw a couple out like peak-to-trough drawdown, monthly draw downs, things like that. Do you think that's relevant in the crypto world and should the average retail investor be looking at those things? Jonney: Peak-to-trough drawdown is a little bit hard to use because the history of Bitcoin and the evolution has been changing very, very rapidly. Tim: I mean what is peak-to-trough drawdown? Jonney: Peak-to-trough drawdown is basically from the high. Jonney: The previous high, what percent is to the low. So most recently it went to $20,000 or $19,000-something and then now we are at $6,000, so the peak-to-trough percentage fourteen over, so around 70%. Tim: Yep. I don't know. Do you look at peak-to-trough drawdown? Tim: And the reason I ask these things...I think it's useful because to me, you're the expert on this currencies, but I think and also to me, it's also a gauge of how risky the asset is. It's another way to roughly look at volatility, right? To me, something that swings that much, the potential upside needs to be a lot more for me to throw my money in versus putting ... I guess it depends on what the goal of the investor is. For me, when I put money in Bitcoin, it's also sizing appropriately, right? Because it's very volatile. I'm not going to size as much as say if I'm putting it in a bond investment and I think that's something that the average retail investor doesn't consider, which I strongly believe they should consider. For instance, if I have $100,000 to invest, does it logically make sense for that retail investor to throw that $100,000 into Bitcoin? Because I think a lot of people do. Just because you think Bitcoin is going to go up or any investment is going to go up, the next question people should ask is what is the risk? What is the return? And what is my sizing? I don't think people consider sizing well. Jonney: You and I probably agree about looking at it that way and that's actually a very institutional way of looking at it, right? Jonney: But for people who are retail investors or people who are just in the market, I think that is probably a little bit more on the complicated side. For me, they should just ask themselves how much of their net worth they're willing to risk with a high chance that Bitcoin might actually go to zero or any crypto they put in, might go to zero. Tim: But I think on that point, Jonney, it's really if we break it down to me, because I mean I'm quite passionate about this as Nate knows as well, that I think for the average person, take crypto aside. The average person has a bunch of money they want to invest for retirement. What I worry about quite candidly a lot of the time is because Bitcoin's gone crazy in December and everyone's friends are calling and saying you should invest in Bitcoin. People just don't consider the size of it. If $100,000 is all your personal net worth, a lot of people realistically if they think an investment is good, will throw that whole thing in that investment, right? So I'm point out things like I think there are certain capital preservative strategies like bonds so I'll say "Maybe you should put $50,000 in bonds." To me, I always harp on about sizing. They should put, like you said, Jonney, only what they're willing to lose into crypto which may be $10,000 or something. That's one high-level question I think people should ask. "How much do I put in?" Which should be based on how much am I willing to lose, for Bitcoin specific, because it's such a volatile asset class. Jonney: For people who are looking to personally invest, it's maybe a 5%-10% range, but they're going back to what the institutions might consider whether that is too much or too little, right? Jonney: Just imagine their hedge fund decides to invest 5%-10% of their assets into Bitcoin or any other crypto and there's a very small chance that it drops massively like 50%, 60%. I mean suddenly the hedge fund is losing 5% of their capital. For a person who has $10,000, losing 5% of capital is $500. It is money, but it's not going to ruin you for the rest of your life. But for a hedge fund, we're talking billions of dollars. So for me, that's a difference between institutional way of thinking and personal finance. Not even crypto investment, just personal finance way of thinking. Tim: That's true, but let me poke at that a little bit. With personal finance, there is some threshold, right? So they're investing $10,000, what is that threshold? But $100,000 for a lot of people is a lot of money, right? Tim: So at what point do you cross over? How do you look at that differently? Is it a threshold like a retail investor investing $10,000, how should I look at it? $100,000? A million? To me, it really is, once it gets to that threshold of money that you're not willing to lose, you need to basically put it in asset classes that are less risky or you could put it say in an arbitrage fund in crypto even though, because I think people confuse the factors where crypto is risky. Well, not really. It depends, right? If you're doing an arbitrage strategy, it's not actually that risky, right? Tim: So I think to me, there's a couple of metrics, how much that retail investor is willing to lose and the size of the [crosstalk 00:11:03] that drives asset allocation. Jonney: I agree. There are strategies in crypto that are less risky than the news headlines makes it, but the majority of people, at least the people I know and I guess, don't have access to these tools. And they are not thinking in that way. They read about the idea, but it's actually a very specialized skill set in order to execute all the trades in order to do the arbitrage. So I mean, it is a valid point, but I don't know whether the access is there for people to do these sort of things. Tim: I guess one common theme takeaway really is for the retail investor the amount of money they put into crypto should be sized. I think there needs to be a point of considering sizing which I don't think is a conversation many people are having. But I personally feel quite strongly about it. Jonney: I actually want to pivot on that because now sizing is kind of a personal sort of emotional how risky you want to be. But for me, do you find the people in the crypto market having to make more emotional decisions than people in institutions? I bring this up because there was an article about a year ago where I think an analyst said that maybe only 10% of trades in the market are done by people and that's including hedge funds. So that means 90% are done by machines. Tim: Mm-hmm (affirmative) Jonney: We need to double check that, but do you think that institutions, they're just doing very, very systematic strategies on the whole while crypto investors are having to deal with these emotional sort of decisions? Jonney: You're talking about crypto market? Tim: Crypto market. So if you've got a hundred trades, I'll say 90, I don't know what the figure is, but in institutional finance I'd agree that 10 out of the 100 are probably done by fundamental buys and the rest is high-frequency market making, all those things make a high volume and as a result, the market is very liquid and much more efficient. That's the way I look at it. Whereas in crypto, especially on the small cap's base, there is not market makers or institutions that are doing arbitrage and things like that yet to that kind of level, so that's why you also get a lot of the swings, in my opinion. Because inefficiencies in equities markets and traditional markets get arbed out efficiently because there are these machines spotting stuff. Whereas in crypto, in the low cap, low liquidity space that doesn't happen. Jonney: So here's my theory, you can push back on this if you want, is that traditional finance as evidenced by the VIX and a drop in volatility has become very boring. And actually it's kind of flipped around because people usually say "Oh, if the volatility is very high, I'm very scared. I shouldn't invest in the market." But actually, I think, you have a generation of traders who realize that they can't really do much with their own money in the stock market and they have to go to crypto where there's a plethora of opportunities for them to enter, so actually volatility has led to people being more interested in finance because they were previously crowded out. Tim: In crypto you mean? Jonney: Well, no. If they were previously crowded out in equity markets because the stock market has moved, it's not exciting, it's hard to find opportunity and with high volatility in crypto, there's a lot more opportunity. That's why people who were more discretionary traders are jumping to crypto. Tim: I think there's two things. Institutional traders, I think, are coming to the market because they sense the opportunity. Tim: Yeah! Every professional trader I've looked at spends time looking at crypto even if they're initially skeptic, I think senses there's opportunity and most finance people are opportunistic. Tim: But I think for the average retail investor, I think they're interested in it quite candidly because of the potential upside in the market. The fact that you could turn $1 into $10,000 with an Ethereum ICO, quite candidly that's very attractive for everyone and I think that's the main draw card for retail investors coming into crypto. Nate: So do you think the opportunities will diminish and how long do you think they'll take before it becomes like the traditional equity markets? Should the current crypto trader be wary or should they embracing it or how should they prepare themselves? Tim: That's a good question. I think the inefficiencies will close definitely. But I think for them to close, you need a large fund flow coming into the market from institutions and in order to do that, there are fundamental problems which need to get solved like how to custody assets, the regulation side of things and then also for institutional investors to get confidence in the infrastructure in the crypto market i.e., exchanges and things like that. Tim: Yeah, no traditional hedge fund is really into the market. Jonney: Into the trend market. Tim: Into the trend market. People do it. Tim: People at banks and stuff do it on their personal account and funds do it on their personal account, but they don't do it in the fund account because A) it's not regulatory compliant. They can't do it by some of their fund docs. It's some rich guy like Jett Marrs family office who can make discretionary decisions like that. Jonney: So for me, I wonder what the crypto trader is going to need to do to keep their edge and frankly, the things are going to get harder. Good opportunity is getting harder to spot. So they have to get educated. Tim: I think there's always opportunity for retail investors in crypto because if you have a knowledge advantage in a fragmented market and you do more research. Jonney: Yeah, there's asymmetrical relation. Tim: Yeah. That definitely, I think, will exist for a period of time because anyone who enters crypto now has a one-year catch up on knowledge, even understanding how to price exchange coins, different utility tokens, different blockchain tokens, things like that. All these things take time to get up to speed. Nate: Another question to you, do you think having too much finance knowledge or too much institutional thinking is that a hindrance or is that a positive? Tim: That's a great question. Tim: To me, I think more information is always better because you can always leverage your experience because I learned a ton about more on the tech than I knew originally when I was researching myself. I think having institutional finance experience is definitely helpful, without a doubt, because there are 101 trading things like you should keep down your commission costs which is universal in any kind of trading outfit. Tim: However, where I think the danger is there are a lot of implicit assumptions coming from finance which don't hold true in crypto. So to me, making good decisions in life and trading and everything is always checking your assumptions and questioning whether they are correct or not. But more information generally is better. But you just need to be self-cognizant. Jonney: Yeah I think it's self-cognizant and probably you have to be a bit open. I'm pretty sure you faced it as well as when I told my friends I'm doing crypto, they thought I was freaking mad. We could very well be mad. Ultimately, the rewards outweigh the risks. Jonney: That's how I saw it. Nate: Yeah, that's interesting. Jonney, you brought up a point which was that you were kind of mixed and there might be a disadvantage from one point of view of having that institutional mindset in crypto. Can you elaborate on that a bit? Jonney: Well, I think, when I say "institutional", we're talking about banks. Not to say that there's no smart people there. Obviously, there are very smart people there. Tim and I both at one point in our lives worked at a bank and they hire very, very talented people, but it's like a lot of big institutions you're weighed down by the thought process because you have to do x, y, zed in order to do the a, b, c that you want to do or a, b, c and x, y, zed depending on how you want to put it and sometimes that weighs down your thinking. You also have a lot of implicit assumptions. Someone told me all the opportunities will be gone in six months from six months ago. But six months now, obviously the opportunity set is smaller, but it's still there. I think if you have too many assumptions, you forget to go investigate and you kind of already close the door before you really enter it to take a look. I think that's where I'd say there might be a burden, but I generally agree with Tim. If you have good fundamental finance understanding, then more information helps. Why wouldn't it? Tim: And I'm a big, Nate knows this and has known me for a long time and I think, I'm a big proponent of generally in life, more education is better and especially, financial knowledge. I'm a big passionate believer that everyone should have baseline financial education. Look, when it comes to trading in crypto, people would just view or look at fundamentals for trading and there are certain binary things that people should be doing: looking at upside versus downside, looking at ... the simplest example is people should be caring about their commission costs. One actionable thing is if you're buying an alt, generally check with exchange has got the best price and who's got the lowest commission, finance, if you use their token, that will effectively give you five basis points .005. Jonney: Yeah, you could also [crosstalk 00:19:33] referral fees as well. There's a lot of other things that people could do that I guess not everyone is efficiently doing. Tim: Yeah. And these things, I think, are ingrained to most institutional traders which is definitely useful knowledge for retail traders to know. Jonney: Yeah, it's kind of crazy because people, for example, Binance, if you use BNB token at current, you still get 50% discount which is 5 BPS, right? Tim: What is BPS by the way? Jonney: This is basis points. It stands for basis points so 100 basis points is 1%. So five BPS would be 0.05%. Jonney: And that sounds like a very minute fraction, but if you iterate it many, many times, if you trade many, many times, BPS things adds up. To give people an example, I mean most major exchanges, their trading transaction fee or clearing costs are fractions of 1 BP and they can make tons of money, so 5 BPS is largely unheard of in liquid exchange. Tim: I think that's a tough one. You probably won't like my answer to that, but I think the honest truth is, people shouldn't dip in and put money into anything, not just crypto, without some base level of education. So do not buy crypto just because your neighbor told you that they made a lot of money in Bitcoin. You should do your own independent research. I think if you have done that research and you think that we are in a multi-year bull cycle like I firmly believe and you really want to 80/20 it and minimize your risk losing money, I would buy the most liquid names in the Index. Do some basic fundamental research on which coins have solid teams behind it and take a bet on small size. In a nutshell, buy the major names like Bitcoin, Ethereum for maybe 70-80% of your portfolio and then pick a few coins on the lower cat spectrum which have the potential to do very, very well but size accordingly. If you have $100,000 to invest, do not dump $100,000 on a small coin. Maybe put $2,000, $3,000. Jonney: For me, I actually have a slightly different view. There's so much information about crypto and crypto finance out there. Some are good. Most of it, it's like everywhere. Some are actually pretty bad. Some are actually flat out wrong, so you have to be careful about what is true and what's not true. Tim: I agree with that. Jonney: So you have to be careful there. What I actually suggest people do is put a very small amount of money. Because, for me, the biggest barrier was actually I was following Bitcoin and the crypto market in the news, just because that was something I was interested in. But my sort of barrier point, because I was just lazy to go set it up, so for, I would say jump in with a very small amount of money. Just so you know you set up accounts. You put in a little bit. You're following it. Jonney: That forces you to do it. I'm not saying 100% put everything down. But once you put a little bit in, and just see if it's for you. If you have no interest, then it's very, very hard to convince anyone. Jonney: Even if you like equity or something like that, right? Tim: Anything. Just put it in because psychologically your money's on the table, you'll be watching it. Jonney: Yeah. And then you can then slowly build up whether you're comfortable putting more money or less money. And actually, for me, Bitcoin like last year, the hardest part was trying to go set up an account. Try to move money to be able to buy Bitcoin. Now with Coinbase and all these other Bitcoin exchanges, it's a lot easier, but it wasn't that straightforward two years. Tim: No. It's still not super straightforward. Nate: Yeah, I actually want to go back to something you mentioned, Jonney. You mentioned that there's a lot of misinformation out there. Because there's a lot of people giving their thoughts on crypto, but I think we can all agree not everyone knows what they're talking about. What are the common pieces of misinformation or myths that you see out there floating around that get pushed a lot in the crypto world what you guys don't really agree with? Jonney: For me, I want to answer the question first, why is there so much misinformation on crypto? And the first thing is that it's actually a wide-open field. Anyone can be an expert right now which is exciting and scary at the same time. Someone who has a good website and publishes a consistent article can suddenly be an authority where in traditional finance, you had to be a Morgan Stanley or a big hedge fund to have a voice. And there's good and bad things about that, but drawdown of having a wide-open field and anyone having authority is that obviously, there's not a lot of fact checking within it. And also there's a lot of guesswork that is just to draw eyeballs. For example, one thing that irks me a lot is when people start drawing a lot of technical analysis graphs and then just showing a direction that it's going to go this way and then people blindly following it. That's actually very dangerous to me. I actually do believe to a certain extent technical analysis, but people just draw some lines saying that it's a triangle or they use some NACB to make some sort of assumption about the future without actually doing any fact test or any historical analysis to see whether this strategy works. And then they're publishing it and people are trading on it and that to me is very scary. Tim: Yeah, no, I think that's a great point and I think you answered it. For me, Jonney, if I dig a bit into that and this is kind of my process as well, to me it's always about education. Technical analysis, yes, I agree with it. I use it myself. But the danger is when there's a technical analysis guru out there and people just follow without being kind of skeptical. Jonney: It also happens in traditional funds as well. Tim: I know. But to me, the most important thing is, go look at it. Go four sources of technical analysis say different things and try to look at the fundamental reason for what drives some of these indicators. For moving average, there's fundamental reasons for kind of why it works. And I think understanding, instead of getting a 10-step formula, people are always trying to get a 10-step formula to trade and make money. It's never that simple. The 10-step formula is go read ten different resources and come to your own conclusion. I mean finance is not, with the exception of some very few strategies like arbitrage and things like that, most of it, you're taking some risk and you're taking some type of directional view. The more educated you are just with generally everything in life, it's better. Don't follow one person. Read ten resources and come to your own conclusion and look at the fundamental reason for why those things exist. I just want to circle back to one thing that, Jonney, you mentioned at the beginning of the podcast. You sort of referenced the financial crisis and the fact that a lot of people felt like maybe they missed out and there's more opportunity now, so they're jumping into crypto. Nate: Millennials, yeah, let's just say, millennials. Do you think there's a chance they may be a bit naive because they weren't in the markets during the global financial crisis? Jonney: I think there definitely is a chance because they're just chasing returns so there's a lot of, I guess the term fomo, people who just, yeah. They think they're missing out and they don't want to miss out again, but at the same time, I think it's a very powerful movement because I think for the first time in a while there's a generation of people who start caring about financial concepts. I think that is a very powerful sort of movement, I guess. Tim: Yeah, I agree with Jonney on that. Jonney: You're supposed to debate me. Nate: I think with that it's time to wrap up. I think Tim Tam has a lot of work to do in the office as does Jonney. But thanks, guys, for listening. We're going to be putting out a lot more of these podcasts in the future, so if you have feedback, just drop it in Telegram t.me/coinfi or leave it in the comments and we'll post the show notes online so anything we referenced during the podcast, you'll be able to access. Thanks for listening everyone. We hope you got something out of this conversation looking at crypto trading from the point of view of a couple of seasoned equities traders. Thanks to Tim and Jonney for taking time out of their busy day to share their thoughts and we'll catch you guys next time on the CoinFi Podcast. Thanks for listening to the CoinFi Podcast. If you enjoyed this discussion and want to hear more, we'd really appreciate it if you took a moment to leave us a review on iTunes. That helps others find us and let's us continue to record more episodes for you guys. If you don't think the podcast is worth a 5-star review, we'd love to know why, so we can improve for next time. Please hop on over to CoinFi.com and leave us a comment. We'd love to hear how we can do better next time. 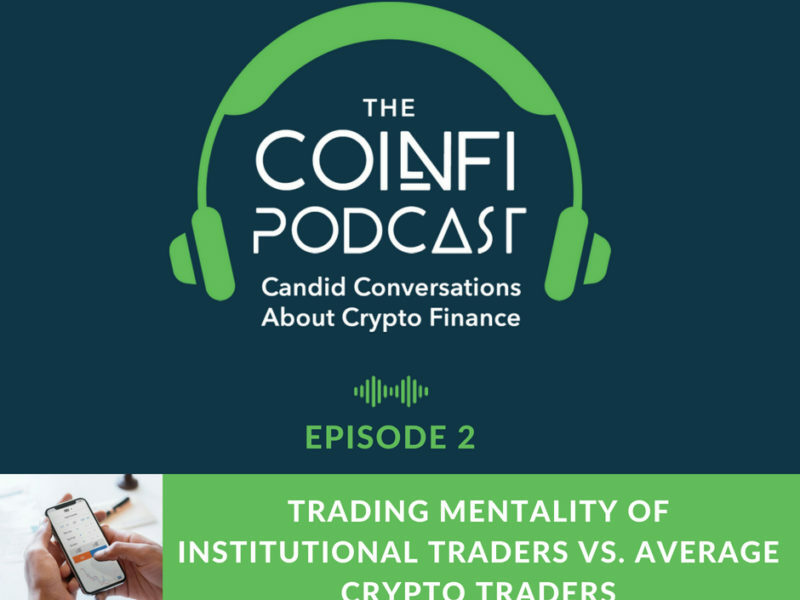 If you're still listening at this point, you might be wondering what exactly CoinFi is. CoinFi is a market intelligence platform for crypto investors powered by the COFI token which is available for trading on Kucoin.com and gate.io. To find out more about the CoinFi platform and the COFI token go to coinfi.com/about. Also, keep an eye out for the launch of CoinFi News. CoinFi News gives crypto investors like you an informational advantage. Be the first to know the news that moves the markets including when a token gets listed on a new exchange. To get early access to CoinFi News, go to coinfi.com/news-beta to sign up as an exclusive beta tester when the product launches later this summer. We're only accepting 500 beta users, so sign up now to reserve your spot. That's all for this episode. See you next time.